Get ready for a jaw-dropping tour of the Southern French Alps - you'll spend the whole weekend up in the mountains walking high wires, riding epic winding roads, diving into waterfall pools and pushing yourself to the top of vertical cliffs... and unwind at the end of the day in your hotel jacuzzi! 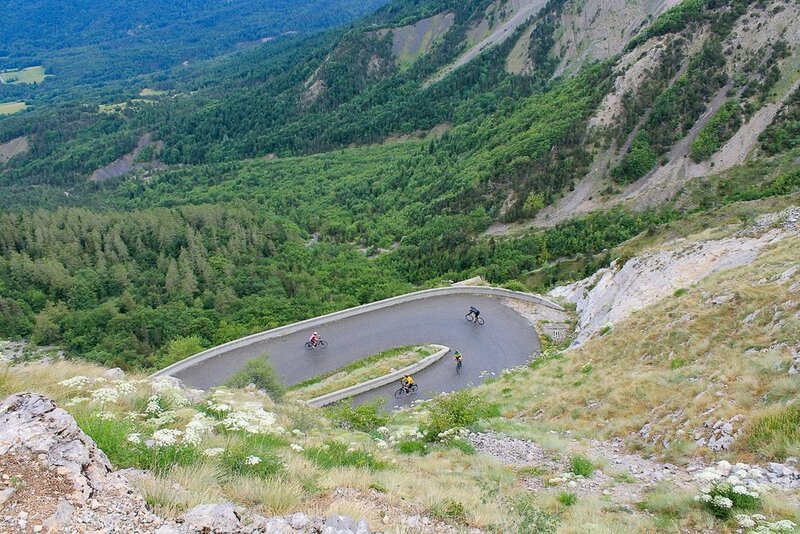 Fancy cycling a bit of the Tour de France route but no time to train for the steep hills? Want to climb on warm rocks, with sun on your back and the scent of lavender in the air? Dream of jumping into deep pools after superman-diving down waterfalls? Wondering what it would feel like to walk across a gorge with only three wire cables holding you up in the air? How about doing all of that in 48 hours? On this adrenaline-fuelled weekend, you will! The Southern French Alps are uniquely famous for beautiful weather (over 300 sunny days a year!) and loads of adventurous activities on offer - the hardest part is deciding what to do... but we've done all the work for you! Across two days you'll get tasters of no less than four adventure activities - and at the end of the day you can wind down in a jacuzzi and heated swimming pool at your three-star hotel! On Saturday you'll get major thrills as you traverse wire ladders and holds fixed into the cliff faces and a suspended wire bridge over a gorge, called a Via Ferrata, then be prepared for a wet and wild afternoon of water-based action down river gorges and waterfalls as you try your hand at canyoning. 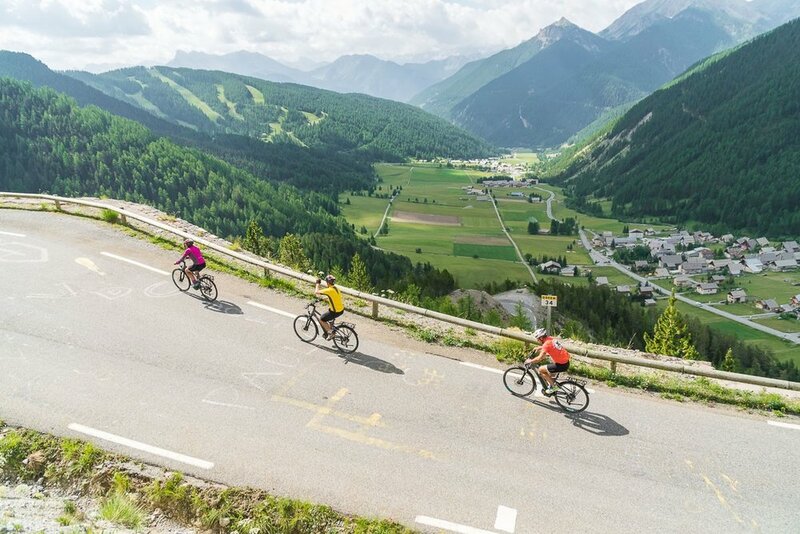 On Sunday you'll cycle an electric bike (e-Bike) over the Col du Noyer, a high mountain pass which is a leg of the Tour de France. E-Biking is a reasonably new adventure activity, with a motor helping you get up the steep hills it makes mountain biking and alpine road cycling accessible to everyone! You'll finish off your weekend getting fantastic views after you've rock climbed to the top of a cliff, before heading home to share stories of your epic adventure! Saturday 28th July: You'll meet your host and get picked up at 7am from Gap Train Station (find out about how to get here on the overnight sleeper train from Paris below!) and you'll be taken to your hotel in the small mountain town of Ancelle to drop off your bags and have a hearty breakfast before your first day of adventure begins! After you've fuelled up you'll spend the morning on the Via Ferrata, followed by a picnic lunch in a scenic spot. Your afternoon will be filled with a canyoning session down river gorges and waterfalls - and you can test your metal by diving into plunge pools from as high up as you dare! In the evening you'll be taken back to the hotel where you'll share a meal as a group and have the rest of the evening to relax in your room, at the bar or in the spa! Sunday 29th July: With a slightly later start, you'll go e-biking in the morning in the mountains up the Col du Noyer, making your way towards a little cafe at the top for a celebratory drink! You'll get another picnic lunch and go on to spend the rest of the day enjoying a roped rock climbing session, before collecting your bags from Ancelle town and being dropped back off in Gap where you can have dinner before heading back to the station to catch your train or plane. You'll get a serious adrenaline pump out of the activities on this weekend - you don't need any prior experience but you do need a head for heights! Everything is suitable for beginners and you don't need to be super-fit - you will be strapped into harnesses and attached to wires where necessary, accompanied by instructors at all times. Please note that if you suffer from vertigo or fear of heights the rock climbing and Via Ferrata activities may not be suitable for you. For the cycling you'll be using electric bikes (e-bikes) so again you don't need to be athlete-fit but the fitter you are the more you'll enjoy it. 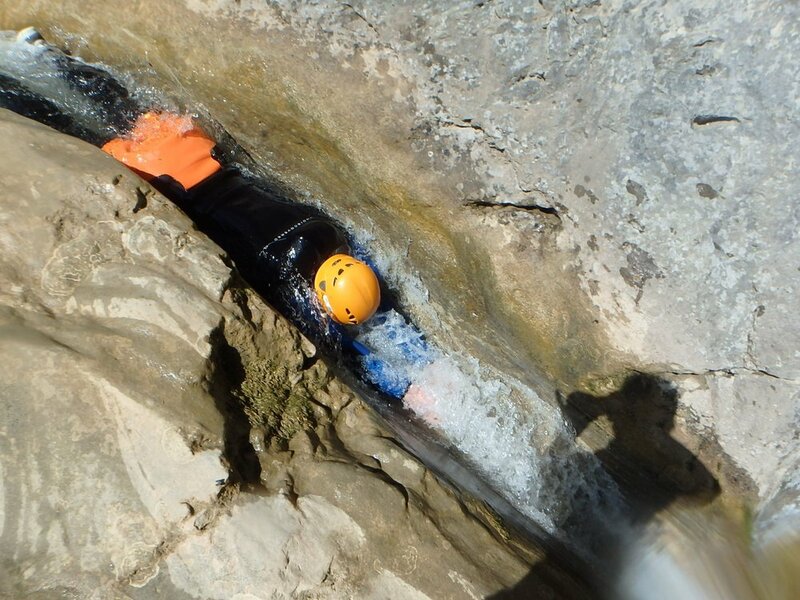 For the canyoning you don't need to have any experience either, just a sense of adventure! The first step is getting to Paris - you can either fly or take the Eurostar that leaves London St Pancras at 16:30 on the Friday night. Once inParis you'll then need to get the Metro Subway Train to Paris Austerlitz - please allow at least an hour if not two for this. The night train leaves Paris Austerlitz at around 21:55 on the Friday night and a couchette costs on average €60 one way. It arrives at 07:00 in Gap on the Saturday morning. On Sunday night it leaves Gap at around 21:55 and gets into Paris at 07:00 on Monday morning. The main advantages of taking the night train are that: if you tie it in with the Eurostar you only need to take Friday afternoon and Monday morning off work, you don't need to pay for any additional nights accommodation in hotels, it is one of the last remaining night trains in France so it is fun and has novelty value, and it is more environmentally friendly. The easiest airport to fly to is Marseille and there are regular flights from all the London airports every day of the week. From Marseille airport, there is a regular coach transfer directly from the airport to Gap Train Station about 4 times a day which costs €41 return. A night in Gap in a local hotel will cost around €80. All specialist equipment for the activities will be provided but you can download our kit list we recommend for our hiking weekends HERE. The list is a recommendation of what to bring in terms of general outdoor clothing but you can adapt it as you like - all bedding and towels are provided at the hotel but you might want to bring an extra towel to help you dry off after your canyoning session! You'll need to pay a £150 deposit on booking with the remaining balance due by 28th April 2018. There are ONLY 15 SPACES on this brand new adventure and we expect it to sell out so book now to avoid disappointment!